Life is short and it's too easy to let it run away from you while you are trying to be all things to all people. As a woman I think it becomes a snare and an obligation where you can allow yourself to be taken for granted and lose yourself in the process. We forget that we have choices - more choices than women our age have ever had. 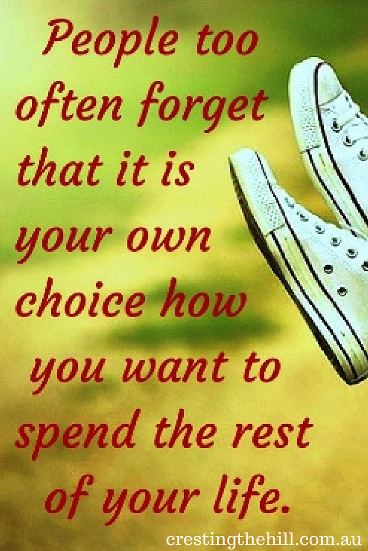 It's time to use those choices to decide how to spend the years ahead wisely. There's a very well known article that circulated around the internet years ago by Bronnie Ware that listed the top five regrets of the dying. Why wait until you're on your death bed to realize that you should have lived your life differently? Why not start now and put some positive energy into living a life that is so rich and full that it leaves you with no regrets when it's time to leave this earth behind? 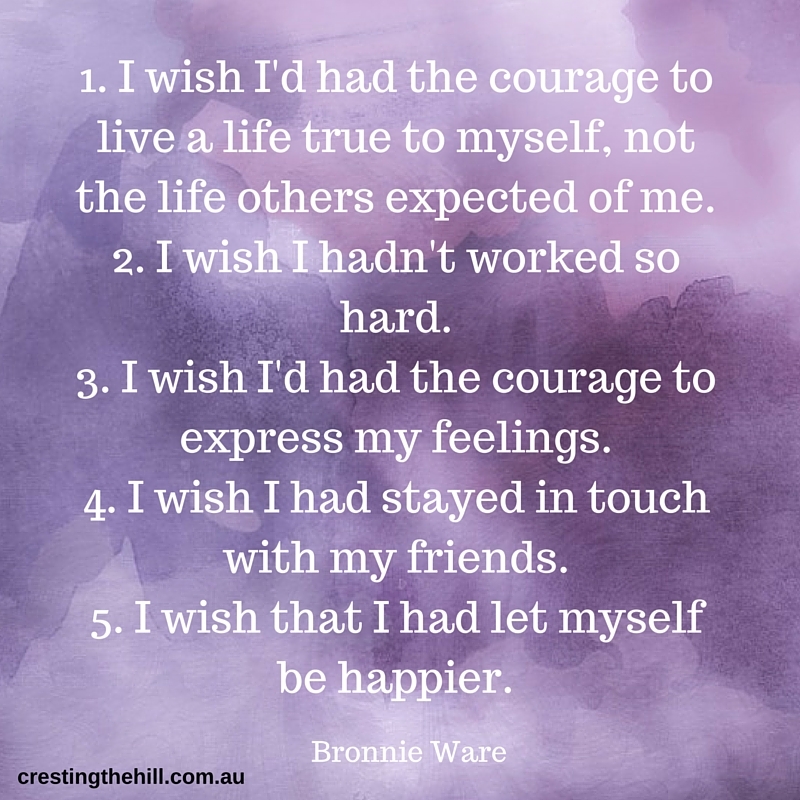 All five of these regrets are so simple to overcome with only minor changes to how we live our lives. Basically they come down to living a life that is simple and relational. The most important thing I've been learning through my Quantum Change is that being true to yourself is the first and foremost priority. It's time to take stock of who our authentic self is and be true to our values (if you don't know what those values are then now is a good time to look into your heart and find out what really matters to you.) If we are living an authentic life then our happiness level will increase automatically - how could you not be happy when you are accepting of yourself and in a good head space? Although knowing ourselves is vital, we still need other people in our lives. It's important to invest ourselves in our family and friendships, we need to tell others that we love them and share how they make us feel. Don't let an opportunity pass by where you could tell someone how much they mean to you. Friendships and family take time and emotional investment but what we reap from that is priceless. Finally, why are we killing ourselves in jobs we don't like? Don't look back and regret these last years of working life as time spent in the salt mines of life. Make some changes - work less hours if you can, or change jobs if you need to. If you can't change your job - make sure you can find the good parts of your current job to focus on and invest in. Killing yourself in a job to make more money to spend on things you don't really need seems to be a major regret - so why do it? Life is short and nobody wants to die with regrets - let's live life to the full and go out with a smile of contentment on our faces! Good list. I have few regrets in my life. 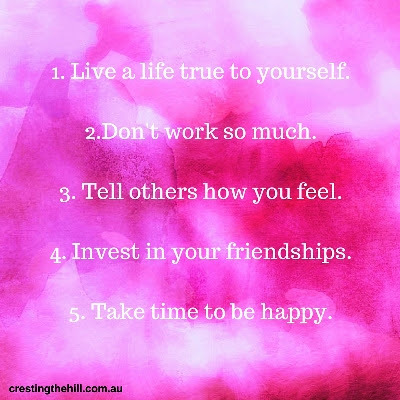 Thanks Denise - I'm the same because I'm learning to put these five things into practice more. I certainly don't want to die wishing I'd worked less! It's funny how we hit the halfway mark in Midlife Alana and suddenly start coming to grips with the fact that our time here is getting shorter and what do we want to do about that fact? For me it's turning out to be quite an eye opener! Hi Shirley - I think if what you do is something you love then it's not "work" Work is when you go to the 9-5 treadmill each day and spend your time counting down until you can go home again. I want balance and interest in my life - that doesn't come from working too much in my books - time for family and friends and leisure is so important. I love you life a regret free life list! YES to every single one of those 5! Thanks so much - and yes you're absolutely right - if we don't intentionally stop and think about what makes us happy and take time to pursue it then we find we've forgotten how to laugh at the end of the day. I hope to die with no regrets about how I lived my life. Of course, my outspoken demeanor may mean no one shows up for the funeral, lol. Great list and great reminders. Sometimes we have to step back and refocus on what we really want from life. It is so hard to get wrapped up in the busy! You're right Andrea - we need to stop and take a look at what is important and how much of our life we focus on that - and maybe re-order our priorities a little before it's too late. Thanks Lexie - it kind of made sense to me to re-jig them into something we can address while we still have time. I wrote about them quite a while ago too Kathy but I think I'm at that stage of life where I want to keep reminding myself to focus on what matters and stop wasting time on things that don't have an eternal value. I agree Leanne it is too late to have regrets in your deathbed. I'm living life to the full with as little regret as possible. Great advice here. You are inspirational for how you live your life Sue - you seem to be getting the balance just right lately - especially with health, family and that gorgeous grandson! I know the feeling Min - it took me to 50 to pull the plug on a job that sucked me dry - it wasn't going to be leaving me any fond memories in old age if I'd stayed there (just made me older before my time!) It's about finding the right amount of time and investment for each area and getting the balance right isn't it? I'm glad you liked it Andrea - it's really about finding your authentic place in the world and not allowing the expectations of others to control how you spend your time. I have no intention of working myself to death - or allowing toxic people to absorb my time and attention. Me too Diane - and btw I quote you in a post next week! I think it gets easier as you get older Jude - you start to think about what time you have left and how you want to invest it. Crappy jobs and crappy people are not on the list for me any more I'm afraid! I feel a bit sorry for guys in this area Jo - their identity is often wrapped up in their job and having a job to talk about is really important - it doesn't have the same power over me and I'm so grateful for that! My mum is very zen about dying. But she also leads a contented life. I tend to think her faith (she believes in God and is pretty religious) helps, but I think some of it is her personality. She sometimes says she's boring or not ambitious, but it's probably everyone else who has it wrong! I'm pretty religious too Deb - but it's also a case of God helps those who help themselves. If you run around doing stuff you hate for people you don't like, it makes life on earth pretty miserable. I think I'm turning it around and leaving people to their own devices and working on a bit of your mum's Zen qualities :) Next I'll be taking up yoga! Once again this is very thoughtful advice, Leanne. Thanks for sharing this #BloggingGrandmothersLinkParty. We all hope to die without regrets, but I guess there will always be something we wish we had done differently. 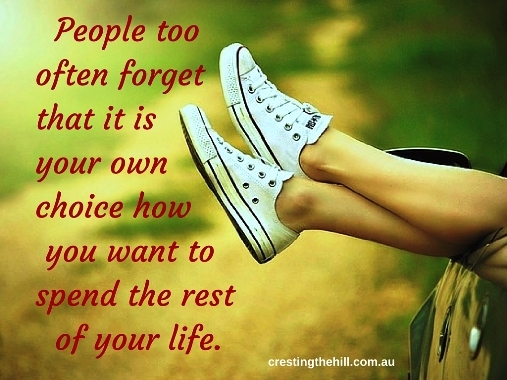 Intentionally thinking about what we really value and prioritizing them the way you have is wise, and important! Of the items on your list, investing in relationships is most important to me. But all of them are important! I'm at the point where finding my voice is what's important to me Wendy - I'm so tired of listening to the opinions of others and trying to keep everyone happy - now there is a bit more of a focus on keeping myself happy! I need to work on the working one. I certainly did too - until a few years ago when I made the big change - although sometimes I wonder if it's "out of the frying pan and into the fire" with my new one - why can't work just be easy and pleasant and fun??? Whenever we're on holidays wondering if we should or shouldn't indulge in something, or have to make big decisions in other areas I always say to the kids "no regrets". The older I get the more I believe that to be true. I have never held that "no regrets" ideology until now Leanne - lately I've come to think that there isn't that much to living a happy life - and not having regrets is one of those simple things - so your "no regrets" might be my midlife mantra! Life is short and you really begin to realize that as you grow older. It's so easy to go through life doing and doing because we think we have too, only to find out at the end that we really didn't "have to" and being full of regrets. Thank you for the important reminder! Thank you for sharing at the #BloggingGrandmothersLinkParty. I've previously commented Leanne but thanks for linking up and sharing with us at #BloggingGrandmothersLinkParty. I've shared on social media. See you at the next one! Great advice Leanne. Thank you for linking up at #BloggingGrandmothersLinkParty! I have shared on social media. 5 beautiful sentiments! Thanks for bringing your post to last week's Blogger's Pit Stop. All young adults or those at least 18 years old should take this into consideration and realize that life really is short. At that age though they think they have all the time in the world. 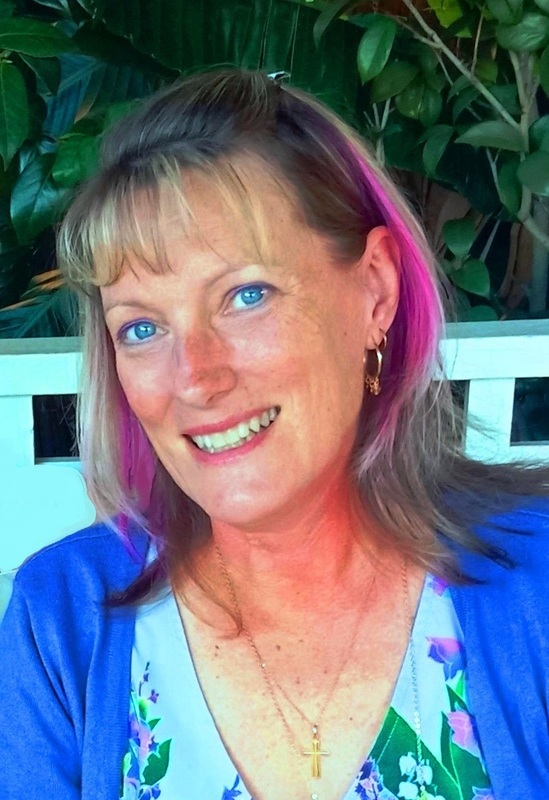 Thanks Leanne for linking up at the #BloggingGrandmothersLinkParty. I shared this post.